On Tuesday, May 30 my peers and I had the immense pleasure of being invited into a discussion about Intersectionality by Dr. Adeola Enigbokan. Being a race scholar and a Black feminist, I am familiar with the theory and practice of intersectionality and how it affects people’s identities and political and social practices. However, Dr. Enigbokan presented to us a novel way of looking at and interacting with Intersectionality by presenting it to us through the lense of a successful slave mutiny that took place on a Dutch East India Company Ship in 1782. Intersectionality as a theory implies that all aspects of a person’s identity be equally considered and acknowledged in the interpretation of their definition of self. For example: a Black, queer, cisgender woman would need to have all aspects of her identity named, acknowledged and validated. She is not only woman, she is black. She is not only a Black woman, she is a queer Black woman. The identities are all equal and cannot be separated from each other. Each piece contributes to her identity as a whole. I have only previously heard of and studied intersectionality in terms of identity, however through the story of the slave mutiny, Dr. Enigbokan challenged us to think of intersectionality as a way of a group bringing together all aspects of their identity and agency, and ripping through white or “blank” spaces. She moved intersectionality from the individual to the collective. The men whose identities were taken and replaced with “slave” came from different geographical locations, spiritual locations, ethnic identities and racial identities. However, during the mutiny they created an intersectional collective identity that allowed for them to resist and eventually, even if momentarily, overcome their oppressors. The mutiny was successful because of the intersect of the sense of individual agency, identity, and then group action. Each slave had to create room for the other, and each individual had to agree to be a part of a collective. Dr. Enigbokan made it clear to us that without the collective acting as one, the disruption of the white or blank space is not possible. 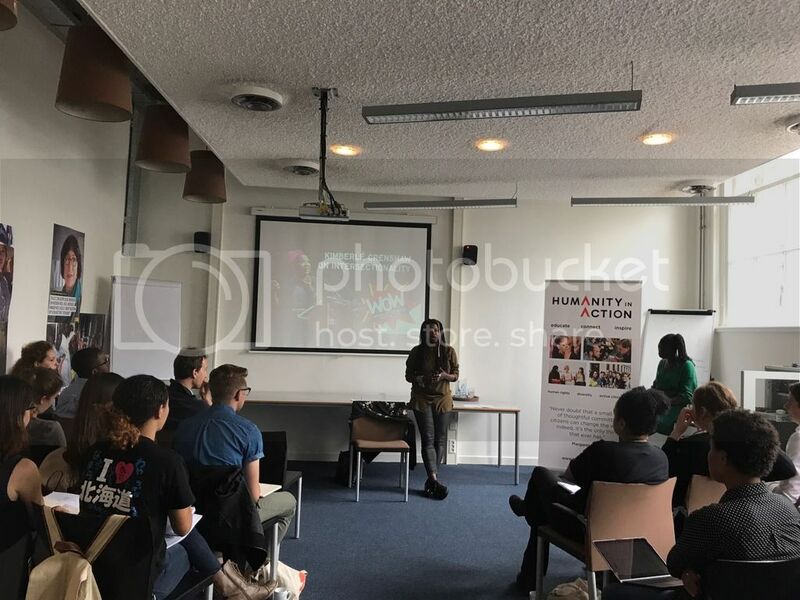 I loved her presentation for us as activists and scholars taking part in Humanity in Action because it reminded me that we all come from different nations, racial backgrounds, sexualities, religions, gender identities, social classes and educational backgrounds. We all are coming together hoping to create change in a world that desperately needs for someone to break through white or blank spaces. Dr. Enigbokan reminded us that without a willingness to bring all of our identities together, accept each other, and learn how to use our collective, intersectional agency, revolution will only be an idea, and never a reality.